Dwayne Johnson stars as a former FBI agent who must save his family from a group of terrorists on a skyscraper in China. 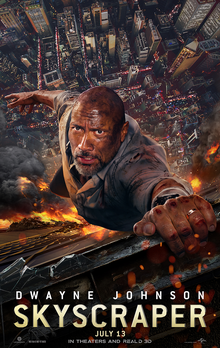 Skyscraper feels like the least unique or memorable thing the studio could go for — the plot feels the exact same as Die Hard and there’s nothing about The Rock’s character to distinguish him from every other role he’s ever played. Even the action often feels effortless and tiring when they could have at least put thought into that aspect. The villainous characters feel cliched and flat while none of the heroes feel interesting either, and the only thing clever about the lead is his backstory. The Rock always gives it his all but continues to find himself in the same recycled role these last few years, and this one is unfortunately no exception for his character. Every move the script makes is predictable and done many times before. Nothing is invented to make the film stick out or feel different from any action film set on a large building or in real-time, and the dialogue and writing are mostly weak and bland. The CG-structure of the skyscraper feels visually engaging in a few shots that should be experienced on the largest screen possible, but that’s about as much as the film has to offer that will keep you amused. Skyscraper is a dull, generic action movie with nothing to offer other than a few cool visuals, and the only excuse for it to be made is so that kids don’t have to watch Die Hard.